Infused with t-essential oils. Goji berry superberry. Paraben SLS & SLES free.This reviving bath fizzer uses a blend of goji berry extracts, tea notes and essential oils helping to deliver nourishment to all skin types To some there is nothing better than a cup of tea and a bath... now you can literally bring that to life! 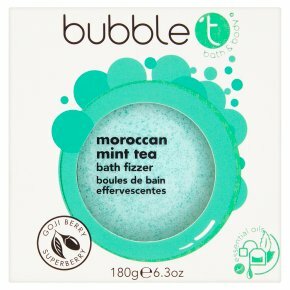 this bath fizzer is bursting with our unique fruit and tea infused fragrances, become the tea bag and be the brew. Directions Drop under warm running water, step in and brew for as long as required. Please retain information for future reference.